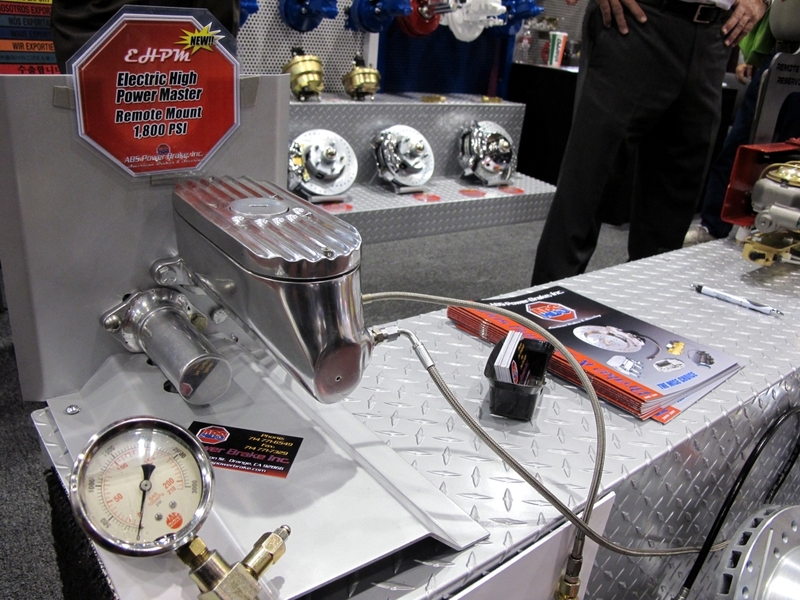 Racing & Performance, Hot Rod Alley, Restoration Marketplace, Tools & Equipment… These are just a few of my favorite sections of the 2010 SEMA show in Las Vegas. What’s a girl to do in a sea of very cool car stuff??? What every guy does of course – run around like its Christmas morning! So while I finish hitting the pavement on the showroom floor to bring ya’ll more info on some very cool stuff, I wanted to at least show you a few of the reasons why people get so excited about SEMA. First of all, there’s some very fun things going on in displays. I’ll never tire seeing an engine put together or taken apart. Especially when that engine is a Corvette LS7 engine as seen in the top picture – as is being demonstrated all week in the Chevy booth. Ya think if I hang around enough they’ll let me turn a wrench?!? 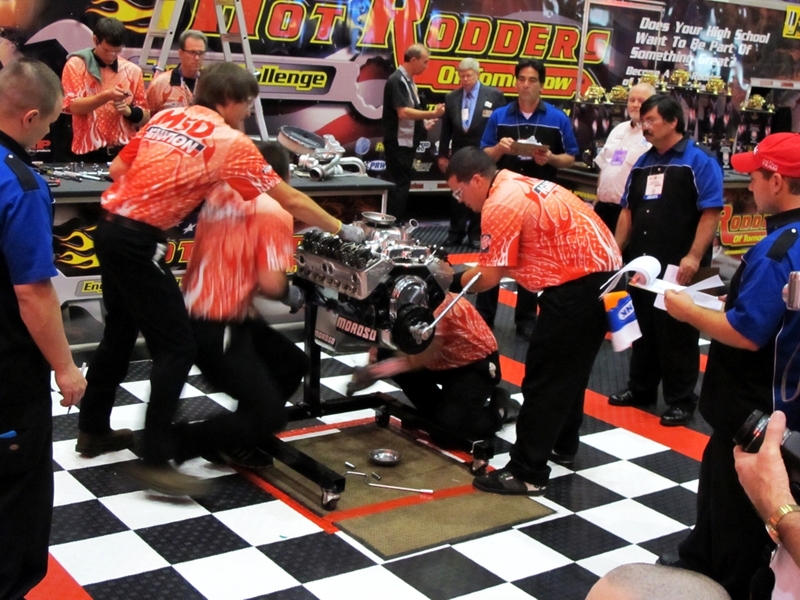 Speaking of turning wrenches, the high schoolers in the Hot Rodders of Tomorrow Engine Challenge National Championship are getting an arm up on wrenching experience. 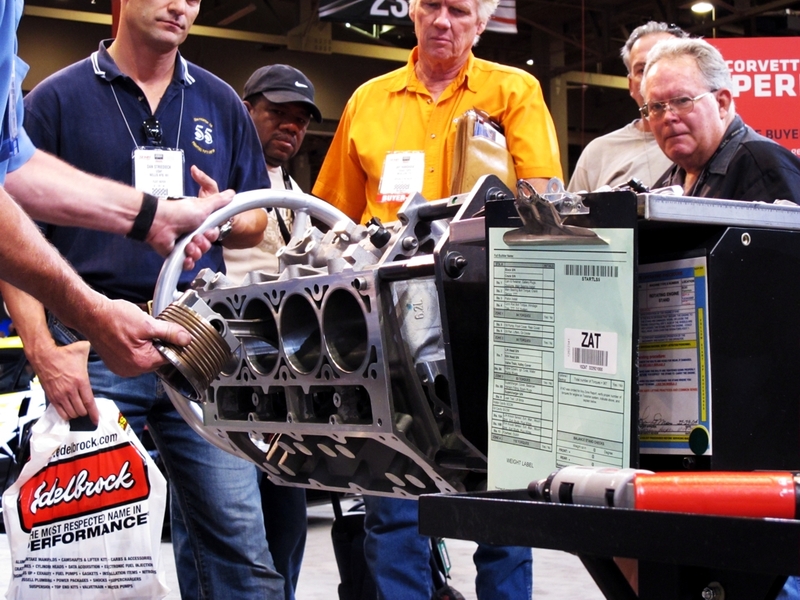 These teams of six race against the clock to rebuild a 350 small block using only handtools. The stakes? Three technological colleges will be awarding the winning teams over $606,000 in scholarships. The team shown above from Eastern Oklahoma Tech Center got their engine together in just over 30 minutes! Other then engine building, of course there’s tons and tons of engine parts! And how can anyone look around at car parts without thinking about what would go good on their own car!? The first (and most important due to my recent brake failure) is brake components! 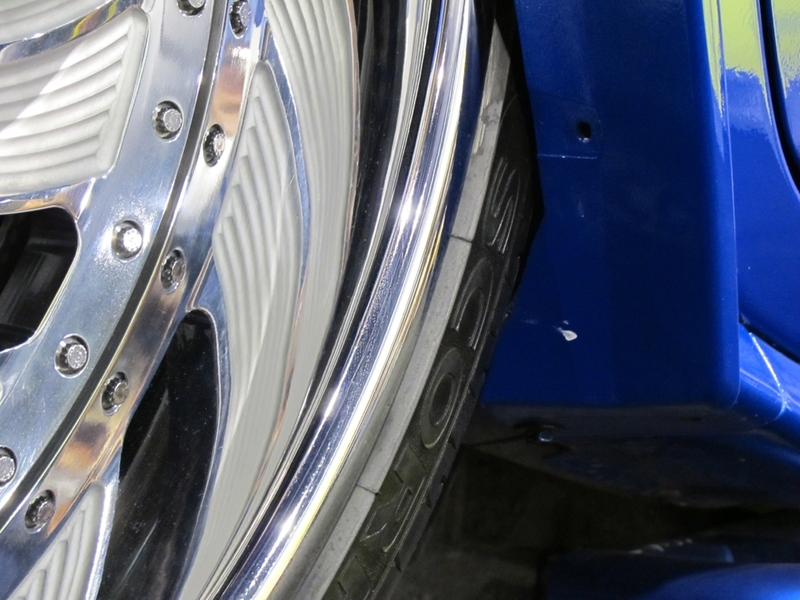 ABS brakes makes not only dual-reservoir master cylinders and power boosting systems that they can make to fit in any car – but they also have a disc brake kit that can fit my Studebaker! 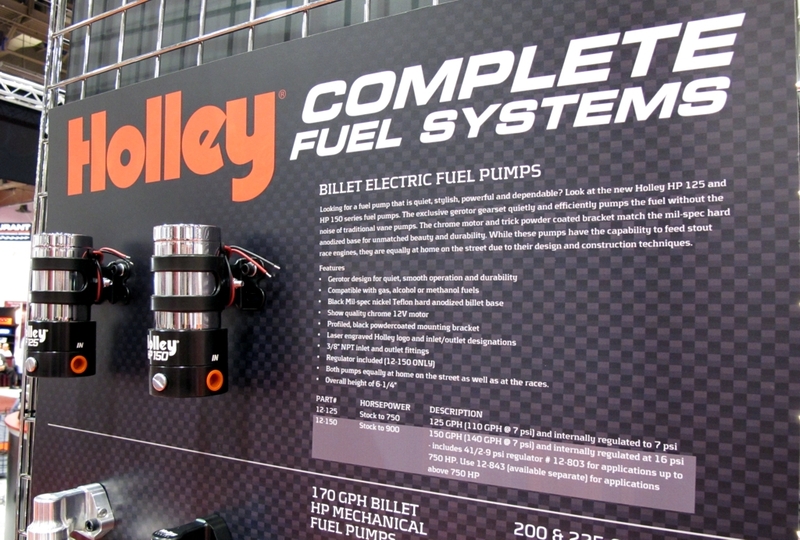 Not as important as braking, but another product that’s new to me and very desirable is the Holley line of Fuel System Components. I have a Holley Carb on my Studebaker – but would love to upgrade my noisy electric fuel pump to one of their top of the line products. While I’m at it I might as well run new line as well, which Holley also outfits. Next year’s wish list perhaps? 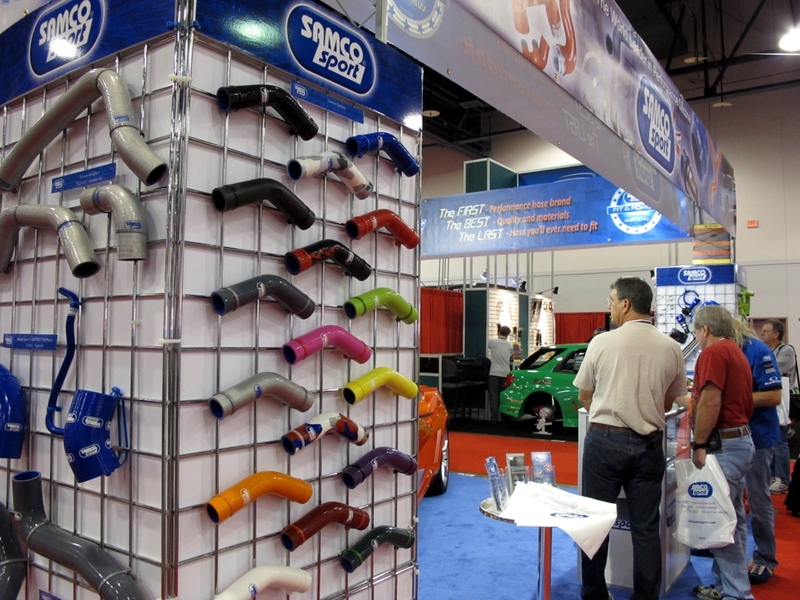 On to less critical issues… I found these color-assorted race grade silicon tubing by SAMCO sport to be very pretty (that’s right, I said “pretty.”) Engine compartments need to look just as good as the rest of the car, right? 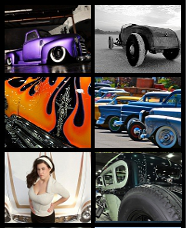 Obviously, there’s much, much more at SEMA then just hot rods. Learning about the other genres of the car world is always interesting. Ingenuity goes a long way – no matter if you’re a hot rodder, street racer, drifter, off-roader, or trucker. One genre that enthralls me is drifting. Drifters do all sorts of crazy things to their cars, extreme tire camber and air foils are just a couple modifications. Not only are there tons of tricked out drifting cars all around SEMA, there’s also a large live-drifting lot in the front area of SEMA where you can actually get a ride in the passenger seat! I’m also looking forward to seeing the skills of Toshiki Yoshioka, world renowned drifter, as he sets the pace during Optima’s Ultimate Street Car Invitational on Saturday! Some other modifications to be seen on the showroom floor are just plain silly. 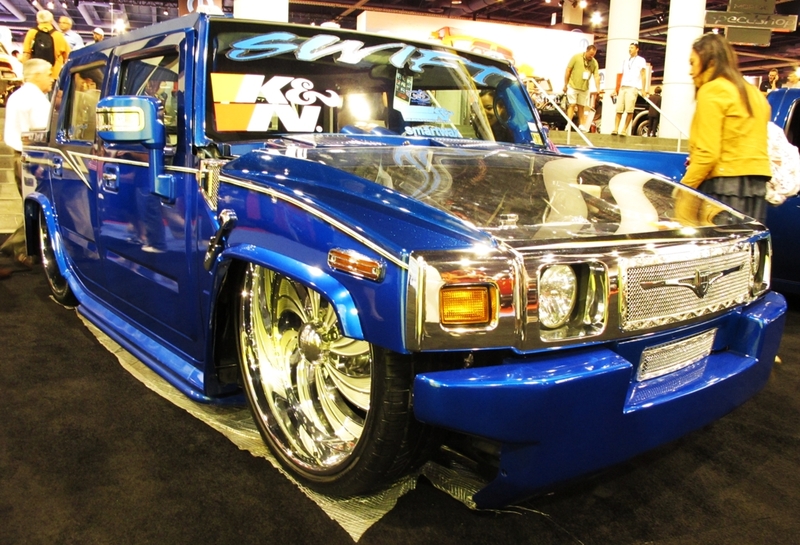 Take for example this modified Hummer with wheels so big they nearly go through the car’s hood. Not that I think this car could actually roll on the street…there’s not more then a millimeters space between the rear tires and wheel wells! Much more practical then the Hummer is this 1955 Chevy Pickup. This is not your average hot rod, it’s an E Rod. 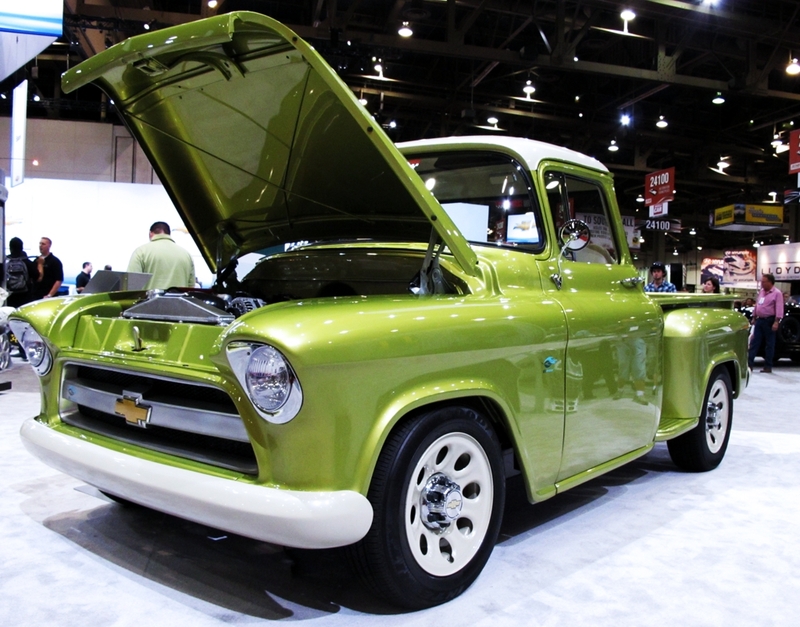 Chevy is working hard to make energy efficient, green modifications that even the hot rodder can roll with. I wouldn’t mind driving this for my daily commute! That’s all for now. One more day of SEMA to go and so much more to do! Tomorrow evening I’ll be leaving SEMA in style, as a passanger in one of the fifty competing Optima Ultimate Street Car Challenge Cars as they embark on a road rally out to the racetrack in Pahrump! So be sure to tune in for more later! What do ya think? 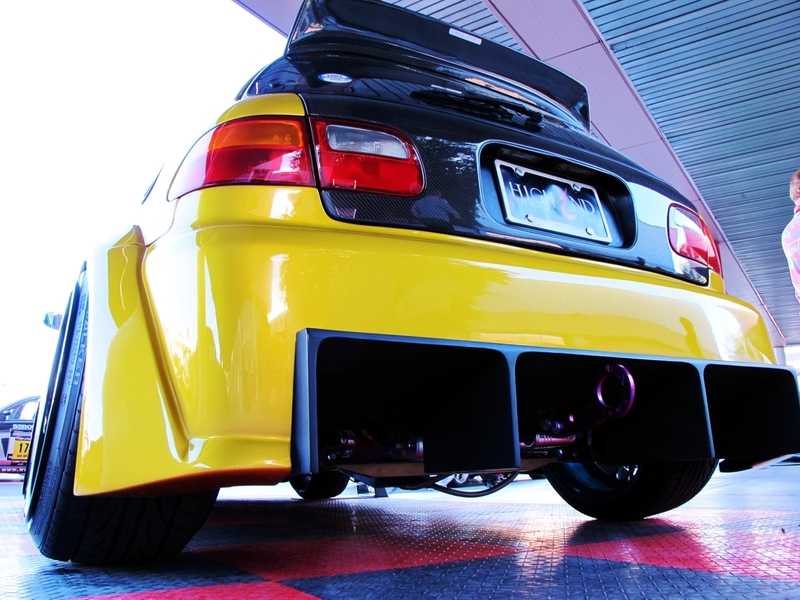 What would you do at SEMA? 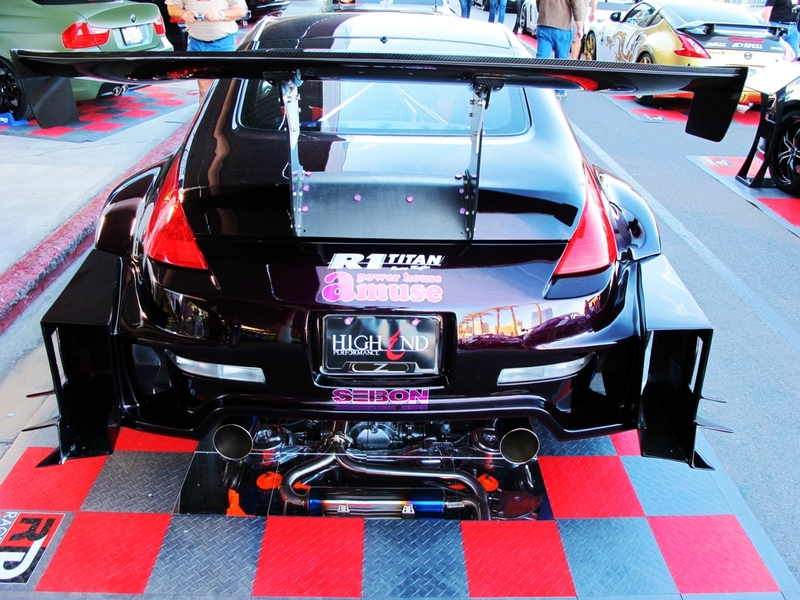 That black 350Z looks more like a Time Attack setup than Drift. That Yellow one is a Civic with some big meats out back. I wonder if its rwd conversion? Cool stuff! Actually the winning teams won over $606,000.00 in Scholarships. Thanks for the nice write up for us! Thanks for the update Rodney. We updated the post. Want to help with a follow-up story about the winning team?